Kerala KEAM CEE (केरल केईएएम सामान्य प्रवेश) 2018: The CEE Kerala has recently released an official notification regarding the Kerala KEAM 2018 and hence it has invited the willing candidates to submit the KEAM Application Form 2018 on or before the last date. Only the candidates meeting the eligibility norms in all the aspects are invited to apply online for the KEAM for getting the admission into engineering courses. Kerala KEAM Common Entrance Exam will be conducted in April 2018. Applicants who wish to know more about this entrance examination they will get all the basic information about the KEAM CEE 2018 which is given as follows. Interested and eligible applicants will be able to register themselves by submitting the KEAM Online Application Form 2018 by following the steps given below on or before the last date. The submission of online applications for KEAM will be started from February 01st week and the candidates will be able to register themselves until the first week of March 2018. Following are the given some basic information on how to apply for the KEAM Application Form. Steps to submit KEAM Online Form. Applicants have to open the official website and do Registration. After the Registration, candidates have to Login on the application panel. Filling the Application form Carefully without making any mistake. All the basic information of the Kerala Engineering Agriculture Medical Given as follow. Candidates who apply for the application form before that they have to meet their eligibility criteria for the Entrance Examination. Here applicant will know about their KEAM Eligibility Criteria which is given down. Age: Applicant minimum age should be 17 years and no maximum age required and there are no relaxations. Education Qualification: Applicant must be passed their 10+2 education qualification from the recognized board And also have to score 50% marks in Mathematics separately and 50% marks in Mathematics, Physics, and Chemistry. Here applicants will get the all the important dates of the Kerala Engineering Agriculture Medical Entrance Examination. Kerala Engineering Agriculture Medical entrance examination center is also providing by us here is the KEAM entrance examination are as follow. To get prepare for the exam all students will require the examination syllabus for the study. In KEAM 2018, the questions will be asked from Chemistry, Math and physics subjects of 10+2 level. Applicants will get complete subject wise Syllabus of KEAM 2018. By using the study material provided here, the applicant will be able to score qualifying marks in their KEAM entrance examination. Following are the Kerala Engineering Agriculture Medical entrance examination syllabus given as follow. Candidates who are on the of complete exam pattern of Kerala KEAM 2018 are advised to follow the details mentioned here. This will help the applicant in the exam through the complete process from the application submission till the seat allotment, through this, the applicants will understand process and way of the examination.This also very help full for the applicant to score good marks in the entrance examination following are the KEAM Exam Paper Pattern given below. Total time duration: 2.5 Hours, i.e. 150 minutes for each paper. Total No. of Questions: 120 questions will be asked in the each paper. After filling the KEAM filling the online application form applicant is waiting for the KEAM 2018 Admit card/Hall Ticket. As the KEAM entrance exam will be conducted in April 2018 and hence we are concluding that the candidates will be able to download their KEAM Entrance Exam Hall Ticket 2018 in the first week of April. Through the KEAM admit card applicant will know about the examination center and place of the entrance examination. Candidate will not allow in the examination center without the admit card. The KEAM 2018 will be conducted in April and the Kerala KEAM 2018 Result will be declared on or before May. Aspirants can check KEAM 2018 Result on the official website. The Kerala KEAM 2018 Answer Key will be out before few days of the results. Applicants will be able to download their KEAM Scorecard from the official website of the Kerala CEE. The counseling process will take place after the entrance examination. In the counseling university will allotted seat to the eligible applicant. Applicants are informed that after the declaration of KEAM Result 2018 in the 03rd week of May, candidates will know about the counseling process and KEAM 2018 Counselling dates. As per the latest updates, we are concluding that the KEAM CEE Counselling process will be started in June. Kerala Engineering Agriculture Medical entrance examination is conducted by the Commissioner for Entrance Examinations (CEE), Kerala Government. 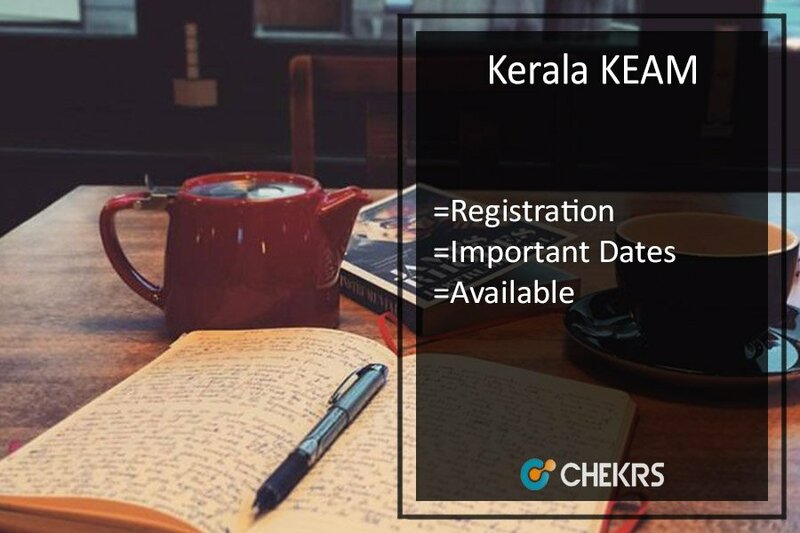 Online applications for Kerala KEAM CEE 2018 will be invited from the candidates satisfying the eligibility norms in all the aspects until the last date. The submission of KEAM Application Form 2018 will be carried out from February 01st week to the 01st week of March. This UG Entrance examination is a State Level Examination that is carried out for enrolling the candidates into different UG programs that are offered by various universities in Kerala. This entrance examination is compulsory for all the candidate who wants to get Admission in the B.Tech programs in Kerala. For any type of assistance, while applying for Kerala KEAM Entrance Exam 2018, you are invited to contact us by leaving your comments at the end of the post.